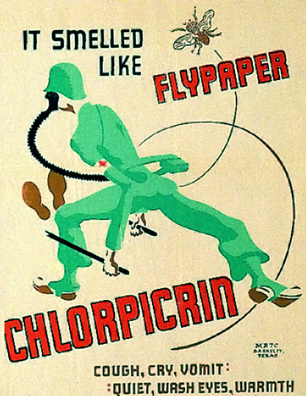 An army poster for “chlorpicrin” identification by scent, from World War II. Chloropicrin is a chemical used in the manufacture of other chemicals and as a fumigant with a wide range of uses: a microbicide, fungicide, herbicide, insecticide, and nematicide. According to a 2007 market estimate, it was among the top ten “most commonly used” active pesticide ingredients. It also has historical use as a chemical weapon, utilized by the Germans in WWI. Chloropicrin is sometimes added to other fumigants as a “warning agent”—due to its strong odor threshhold, adding it can increase the detectability of other less perceptible chemicals. Chloropicrin can also form as a by-product of chlorinization, but reduces quickly to chloroform during treatment when chlorine reduction agents are added. It is only partially soluble in water, and has a higher density, so it will often sink to the bottom of groundwaters. Chloropicrin is highly toxic with acute exposure, causing eye and skin irritation, vomiting, respiratory damage, and with exposure to large amounts, lung fluid accumulation, unconsiousness and death. The carcinogenic potential of chloropicrin is unknown; in scientific studies, animals exposed have not survived long enough to develop tumors. According to the EPA, chloropricrin is best treated with chemical oxidation.